Friends of Covenant Bay Bible Camp from the community and across the province gathered at the camp on Pigeon Lake Saturday evening, June 9, for the First Annual Fundraising Barbeque and Celebration. During the course of the evening, guests shared stories from the 85 years of summer camps at Covenant Bay and looked forward in anticipation to Covenant Bay becoming a year-round camp and retreat center. The evening was an amazing success with over $186,000 raised for the building of year round accommodations for Covenant Bay campers and retreat guests. Fundraising continues with completion of this project being projected for 2017. 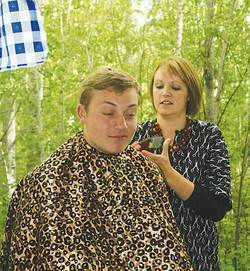 A delicious barbeque dinner was served by Wetaskiwin’s Bearco Catering, music, comedy and story-telling filled the evening and several people had their hair and/or beards shaved as part of the fundraising efforts. Many camp stories spoke of the impact the camp had on their lives, the lives of their families and the community. Among those who shared throughout the evening were Bert and Vivian Weaver of Wetaskiwin. They were some of the first campers at Covenant Bay in its early days. Bert told stories of being part of Covenant Bay’s first camps where he met his wife Vivian. Vivian shared her adventures of tenting in the pouring rain with friends and family and what camping was like when she was young. The Weavers have been participants, strong supporters and volunteers at Covenant Bay for over 80 years. Covenant Bay summer camps started in 1929 near Mameo Beach and in 1932, the camp moved to Point Inspiration, now part of the Pigeon Lake Provincial Park. In 1967, Covenant Bay relocated to its present site just south of the park boundary. Jon Drebert, Executive Director of Covenant Bay, spoke well regarding current programming and future plans. The goal of Covenant Bay Bible Camp has always been and continues to be providing a natural setting in which to “promote a growing relationship with Jesus Christ.” It offers a variety of programs ranging from Summer camps to Day camps, Adventure camps to Mountain Hiking camps and Leadership programs to retreats offered from May to October each year. Covenant Bay also rents out its facility for family reunions, wedding, community gatherings and other summer camping groups. Besides offering campers biking, adventure camping, a variety of water front activities such as swimming, wake boarding, skiing and canoeing, Covenant Bay has added a 32 foot high climbing wall to its property this year which will challenge the most avid climber as well as summer campers and adventure groups.